The Financial Services and the Treasury Bureau (FSTB) published the Open-ended Fund Companies Consultation Paper (see archive) (Consultation Paper) and a press release (see archive) on 20 March 2014 setting out the government's proposals to allow the establishment of open-ended fund companies under the Securities and Futures Ordinance (SFO). Currently, an open-ended investment fund may be established under Hong Kong law in the form of a unit trust by way of a trust deed but not in corporate form due to the various restrictions on capital reduction under the Companies Ordinance (CO). Following the announcement by the Financial Secretary in the 2013-2014 Budget in relation to legal and regulatory frameworks that would enhance Hong Kong's position as an international asset management centre, the government proposed to complement the existing unit trust structure by an open-ended company fund (OFC) structure, which will be an open-ended collective investment scheme structured in corporate form with limited liability and variable share capital. Given the greater popularity of corporate fund structures internationally, the proposals aim to offer market participants greater flexibility in establishing and operating funds in Hong Kong in the hope of encouraging more mutual and private funds to domicile in Hong Kong. The FSTB welcomes responses to its proposals during the three-month consultation period ending 19 June 2014. This newsletter will summarize the proposed structures of OFCs as set out in the Consultation Paper. The proposals set out in the Consultation Paper cover the legal framework, regulators, legal structure, formation and incorporation, administration and operation, protected cells, termination and winding up, regulatory regime, and tax and other issues relating to OFCs. It is proposed that the new OFC vehicle be established under the SFO and be regulated and supervised by the Securities and Futures Commission (SFC). The enabling provisions will be set out in the SFO to facilitate the making of a separate piece of OFC subsidiary legislation governing the detailed regulation of this new vehicle. The government may also consider amending certain provisions of the SFO (e.g. those dealing with the SFC's investigation powers) so as to extend their application to OFCs and key operators such as directors, investment manager and custodian (where necessary). The FSTB envisages that the amended SFO and OFC subsidiary legislation will set out the full scheme for OFCs and deal with matters relating to the creation and regulation of OFCs except for certain winding up provisions which will be covered by reference to the existing winding up procedures under the Companies (Winding Up and Miscellaneous Provisions) Ordinance (C(WUMP)O). Termination and winding up requirements. Mandatory corporate filing and reporting obligations. Enforcement powers (supplementing existing provisions in the SFO which already apply or are extended to OFCs, their officers and other key operators). It is proposed that a separate OFC Code, issued under section 399 of the SFO, will supplement the SFO and the OFC subsidiary legislation by implementing more detailed requirements relating to the OFC and its operation. The OFC Code, administered by the SFC, would be applicable to all SFC-registered OFCs whether publicly or privately offered. Publicly offered OFCs required to seek SFC-authorization would also have to comply with the applicable requirements under the SFC Handbook for Unit Trusts and Mutual Funds, Investment-Linked Assurance Schemes and Unlisted Structured Investment Products including the Code on Unit Trusts and Mutual Funds (SFC Handbook). It is proposed in the Consultation Paper that the SFC will be empowered under the SFO/OFC subsidiary legislation to register OFCs and to approve the appointment and replacement of key operators of the OFC including individual board directors, the OFC custodian and SFC-licensed or registered investment managers. It is also proposed that OFCs which are seeking to offer their shares to the public must obtain SFC authorization under Part IV of the SFO unless an exemption applies, and comply with the SFC Handbook. The Consultation Paper proposes that the SFC will undertake the securities-related enforcement matters relating to OFCs. Please refer to section 9 below for more details on the SFC's supervisory role in the proposed OFC regime. providing the public with services to access the OFC information held by the CR. Please refer to section 5 below for more information on corporate filing functions. The Consultation Paper proposes that the CR will administer relevant corporate filing breaches under its existing enforcement procedures. The termination of an OFC is proposed to be subject to the SFC's prior approval. It is proposed that the Official Receiver's Office (ORO) will administer any court-ordered compulsory winding up procedures (similar to those applicable to conventional companies formed under the CO) of an OFC. The ORO will administer relevant breaches under its existing enforcement procedures. Please refer to section 7 below for more information on the procedures for termination and winding up of an OFC. have their assets held by independent custodians. As the OFC is proposed to be a pure legal vehicle for investment, it would not be required to be licensed as a licensed corporation under Part V of the SFO. The OFC would have to be registered with the SFC under the amended SFO/new subsidiary legislation, and to apply for registration1, it is proposed that certain basic registration requirements will be required subject to the SFC's vetting. shareholders must be entitled to have their shares redeemed or repurchased at a price based on the net asset value of the fund. Please refer to "Articles of incorporation" under section 4 below for more details on the OFC Articles. properties of the OFC must be entrusted to a Hong Kong incorporated custodian acceptable by the SFC for separate and independent safekeeping of the assets belonging to the OFC. It is proposed that the board of directors will only be natural persons and for better transparency, corporate directors will not be allowed. The board will be legally responsible for all the affairs of the OFC. In keeping with an OFC's status as an investment fund vehicle, its day-to-day management and investment functions will be carried out by an SFC licensed or registered investment manager appointed by the OFC's board of directors. The board will play a supervisory role, providing an additional layer of oversight for the shareholders. directors must be of good repute, be appropriately qualified and experienced for the purpose of carrying out the business of the OFC. The duties and functions of the investment manager will be set out in the OFC Code. other applicable regulations under the SFO and other SFC regulations. regulatory compliance in accordance with the OFC Code and other applicable regulations. It is proposed that the assets of the OFC be segregated from those of the investment manager and entrusted to a separate, independent custodian for safekeeping. The custodian must be incorporated in Hong Kong and be acceptable to the SFC, and will be subject to the same eligibility requirements as required under the SFC Handbook. maintaining proper segregation and independent custody of the OFC's assets. The applicant applies to the SFC for approval of the OFC. The SFC reviews the application, including whether it meets the regulatory requirements to be stipulated in the SFO and relevant subsidiary legislation, rules, regulations and codes. The registration of the specified form and the constitutional documents and the issuance of a certificate of incorporation by the CR confer corporate status upon the applicant entity from the date of the incorporation (i.e. the date of the certificate of incorporation). The body corporate may exercise all functions of an incorporated company as a full legal person. Once incorporated, the SFC will include the OFC's name in the SFC's list of registered OFCs. The CR will also include the OFC's name in the CR's list of OFCs and make relevant documents available for public search (e.g. constitutional documents and the certificate of incorporation). 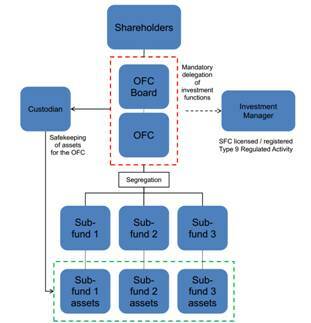 entities other than OFCs registered with the SFC should be prohibited from using the title "open-ended fund company" or "OFC". entrusting the OFC's property to a separate, independent custodian for safe keeping. It is proposed that the investment scope of an OFC should align with those types of investment activities4, which are subject to licensing and regulation by the SFC under the SFO. 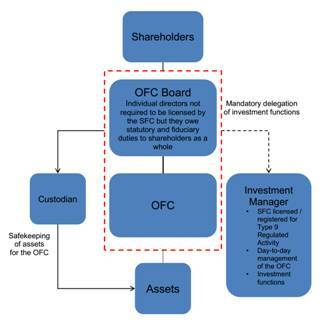 The Consultation Paper notes that the reasons for restricting the types of asset classes in which an OFC can invest are that the primary purpose of a Hong Kong OFC (regardless of whether it is publicly or privately offered) will be to operate as an investment fund, and the OFC is not designed to operate as a corporate entity for the purposes of general commercial business or trade. enable all existing fund managers licensed by or registered with the SFC to carry out Type 9 (asset management) regulated activity to apply to manage OFCs without the need to apply for any new licences. Publicly offered OFCs must comply with applicable investment restrictions set out in the SFC Handbook. conduct and disclosure requirements that are in line with international regulatory standards and within the investment scope as described above. be up-to-date as open-ended OFCs are offered on a continuous basis. obtain the SFC's authorization5, after which the offering document should be filed with the CR prior to issue. It is proposed that annual general meetings would be optional. However, shareholders with 5% of the voting rights of an OFC should have the right to requisition an extraordinary general meeting. resolution thresholds (a simple majority for ordinary resolutions and a majority of at least 75% for special resolutions). It is also proposed that publicly offered OFCs will need to comply with existing meeting requirements under the SFC Handbook. unaudited interim report and accounts. the accounts of each individual sub-fund. Publicly offered OFCs must also comply with the reporting requirements under the SFC Handbook. OFCs would have to comply with relevant statutory corporate filings requirements such as annual return, notification of change of directors or change of address of the registered office. Further review will be conducted by the SFC and CR to formulate the detailed corporate filing requirements for OFCs. It is proposed that the share capital value will be determined by market needs and not restricted to a minimum or maximum share capital value. The share capital rules in the CO relating to capital maintenance, increase and reduction of capital are not applicable to OFCs because of their open-ended nature. There should be no fundamental differences in treatment between public and private OFCs because valuation and pricing is a fundamental aspect of an investment fund's operation. It is proposed that the offer and redemption prices be calculated on the basis of the OFC's net asset value divided by the number of shares outstanding and that such prices may be adjusted by fees and charges, provided the amount or method of calculating such fees and charges is clearly disclosed in the offering document. Public funds should follow the requirements set out in the SFC Handbook and valuation rules for both public and private OFCs would be set out in the Articles. Investment managers of all OFCs are also expected to observe applicable requirements under the SFC Code of Conduct and Fund Manager Code of Conduct. suspension or deferral of dealings in privately offered funds will be allowed subject to full disclosure of the circumstances in which dealing may be deferred or suspended in the OFC's Articles and offering document (to enable more flexibility for such funds to manage fund liquidity). The Consultation Paper notes that the FSTB does not intend to make prescriptive rules on how and when an OFC should make distributions to shareholders, which are usually commercial decisions made by the investment manager. It is proposed that OFCs should be allowed to make distributions out of capital subject to solvency and disclosure. An OFC's distribution policy (which includes whether distributions may be made out of capital) and any associated risks must be clearly disclosed in the OFC's offering documents. An umbrella fund can have several sub-funds. However, if there is no legal segregation of liabilities between different sub-funds and assets of one sub-fund can be utilized to meet the claims of another sub-fund, there may be a potential contagion risk to investors. A protected cell regime addresses this contagion risk by providing for a legally enforceable segregation of the assets and liabilities of each sub-fund. where assets or liabilities are not attributable to any particular sub-fund, the OFC may allocate them in a manner which it considers to be fair to shareholders. The aforesaid segregation will also make it easier for individual sub-funds to be wound up as if it were a legal person in its own right and therefore any winding up of a sub-fund could be done more efficiently and without much impact to the umbrella OFC. There is no guarantee that Hong Kong's interpretation of a protected cell regime would be upheld by courts in other jurisdictions. The Consultation Paper therefore suggests that the OFC prospectus should include a disclosure warning that such protected cells may not be upheld in foreign courts. reasonable prior notice has been given to shareholders. a declaration signed by the OFC board and the investment manager confirming that all assets have been distributed to shareholders in accordance with the OFC Articles and the OFC has no outstanding liabilities. The OFC would be dissolved as soon as practicable after the SFC's approval for de-registration. The SFC would notify the CR after dissolution of the OFC to allow the CR to update the OFC's status. the established requirements and procedures9 that are applicable to members' voluntary winding up of conventional companies as set out in the C(WUMP)O should apply in the case of voluntary winding up of OFCs for protection of shareholders and creditors. It is proposed that the winding up of an insolvent OFC would be in accordance with the requirements and procedures set out in the C(WUMP)O. The custodian would also be able to present a petition to the court for the winding up of an OFC. An OFC could also be dissolved by being struck off the register by the SFC where the OFC is defunct or in other circumstances as specified under the new legislation. The new OFC legislation and the OFC Code would set out the key functions and duties of directors and other key operators of OFCs which must be complied with for so long as the OFC remains registered with the SFC. It is proposed that the OFC be subject to post-registration monitoring and supervision under the new legislation and the OFC Code. Publicly offered OFCs would also be subject to on-going post-authorization requirements under the SFC Handbook. While there will be a mandatory delegation of all investment functions and the day-to-day management of the OFC to a SFC-licensed or registered investment manager, neither the OFC itself nor its directors will be required to be licensed by the SFC (please refer to the section "Legal Structure" above for more information). Since the SFC's existing powers over licensees will not extend to the OFC or its directors, the SFC has proposed that it should have additional enforcement powers over the OFC vehicle itself and the individual directors to safeguard investor interests. the SFC's existing powers to compel the provision of information relating to transactions and the production of documents and/or answers to questions during investigations and to apply to the courts for warrants to search premises and seize documents under the SFO in relation to OFCs. It is proposed that the SFC should be vested with the power to intervene in the business and management of an OFC, as the SFC's current powers to issue restriction notices will not apply to the proposed OFCs as they will not be licensed by the SFC. requiring a director of an OFC to cease transfers to and/or from his own shareholding in the OFC. suspected manipulation of the market asset value of an OFC. Power to bring civil proceedings for protective and remedial orders against a person who has contravened any provision of the SFO or licensing or registration terms and conditions or any other condition, notice or requirements imposed under section 213 of the SFO. where the company has not given its shareholders any information that they might reasonably expect in relation to its business. requiring investments in an OFC to be realized and the proceeds distributed to its shareholders. offshore funds with their central management and control located outside Hong Kong. For the purpose of section 20AC of the IRO, the central and management control (CMC) test is applied to the fund itself (i.e. at the OFC level). If the CMC of the OFC is not exercised in Hong Kong, the OFC can qualify for the profits tax exemption under section 20AC notwithstanding that the OFC is incorporated in Hong Kong and its asset portfolios are managed by a SFC-licensed/registered Hong Kong fund manager with full discretionary power. The Consultation Paper notes that the exemption or the extent of the exemption that should be applied to privately offered OFCs with CMC located onshore will be considered carefully having regard to possible read-across implications. Under the proposals, allotments, transfers and surrenders (e.g. in the case of redemptions) of shares in OFCs may be treated in the same way as units in unit trusts for stamp duty purposes. The Consultation Paper sets out details of the stamp duty treatment of allotments, transfers and surrenders of units in unit trusts, as below. If the transfer of a unit in a unit trust is required to be registered in Hong Kong, then that unit is "Hong Kong stock" and instruments effecting the transfer thereof are liable to duty in accordance with Head 2 of the First Schedule of the Stamp Duty Ordinance (SDO). The rules relating to contract notes as set out in section 19 of SDO generally apply to dealings in the units. Transfers of ETF instruments are not stampable if the value of Hong Kong stocks does not exceed 40% of the aggregate value of the underlying portfolio. The initial allotment of a unit by the trustees is not subject to stamp duty because according to section 19(16) of SDO, "sale or purchase" is defined to mean any disposal or acquisition (other than an allotment) for valuable consideration. Where the unit is surrendered to the trustees or managers (e.g. in the case of redemption) and the unit is then extinguished, no ad valorem duty (i.e. 0.1%) is payable by the managers as section 19(1A)(a) of SDO provides that section 19(1) of SDO (which requires a person effecting the sale or purchase of Hong Kong stock to make, execute, and stamp contract notes) does not apply to a sale or purchase of a unit under a unit trust scheme where the transaction is effected by extinguishing the unit. Only a fixed duty of $5 is payable on the surrender of a unit where this involves extinguishing the unit. While an OFC is an investment fund vehicle, it takes a corporate form and it is therefore proposed that OFCs should be required to register for business under the Business Registration Ordinance and complete tax returns to report income accrued to employees and profits whether fully or partially exempt from profits tax. Question 1 Do you agree with the overarching principles for OFCs? Question 2 Do you consider it agreeable to set out the legislative framework for OFC in the SFO and the relevant subsidiary legislation in the proposed manner? Question 3 Do you think the proposed scope of the code and guidelines could adequately cater for the OFC regime? If not, what other essential features should the codes and guidelines include? Question 4 Do you agree with the proposal that the SFC should be the primary regulator of OFCs? Question 5 Do you agree with the proposed role and functions of CR in the OFC regime? Question 6 Do you agree with the proposed role of ORO and SFC in respect of proposed termination and winding up arrangements for OFCs? Question 7 Do you think the proposed features comprise the essential features of an OFC? If not, what other essential features should an OFC possess? Question 8 Do you agree with the proposed features for the Board of Directors? Do you think the proposed structure of the Board and the proposed criteria of directors will be able to render adequate investor protection to those investing in OFCs? Or do you think the proposed structure is too onerous, and would hinder the development of OFCs in Hong Kong? Question 9 Do you agree that the OFC board must delegate the day-to-day management and investment functions of the OFC to an investment manager who is licensed by or registered with the SFC to carry out Type 9 (asset management) regulated activity? Question 10 Do you think the proposal to require a custodian in the OFC structure could foster the protection of investors in an OFC? Do you consider the proposed requirements and duties for a custodian adequate to meet this objective? Question 11 Do you agree with the proposed arrangements in relation to the incorporation of OFC? Question 12 Do you consider the proposed naming convention provides sufficient level of clarity to investors? Question 13 Do you agree that the proposed Articles are adequate? What features should the Articles include? Question 14 Do you consider the proposed investment scope and strategies could provide a competitive framework for OFCs in Hong Kong with sufficient safeguards for investor protection? Question 15 Do you agree with the proposed arrangements in relation to the offer of OFC shares? Question 16 Do you agree with the proposed arrangements regarding corporate administration? Question 17 Do you agree with the proposed arrangements in relation to fund operation? Are the proposed principles and arrangements adequate to cater for the practical operation for OFCs? Question 18 Do you agree with the proposed arrangements in relation to protected cells? Question 19 Do you think the proposed termination procedures are adequate to provide an expedient way for terminating a solvent OFC? Question 20 Do you have any comments on the proposed termination, winding up and dissolution arrangements for OFCs, including the proposed power to be given to the custodian to petition to the court to wind up an OFC? Question 21 Do you consider the proposed powers are essential and proportionate? Question 22 Do you think the existing profits tax exemption regimes for public funds authorised under section 104 of the SFO / bona fide widely held regulated funds and offshore funds are adequate to cater for OFCs? Question 23 Do you consider that the proposed stamp duty treatment on sale and transfer of shares in OFCs can cater for the market needs? Question 24 Do you consider the proposed tax filing arrangement agreeable?